1. A cookbook filled with delicious sandwich, scone, cake, and other recipes for accompanying your delicious cuppa tea — it's like a trip to high tea across the pond only you don't need a plane ticket. How do salmon and whipped cream cheese sandwiches sound? What about malted milk egg custard tarts? Perhaps prosecco, lime, and mint jellies, or cucumber sandwiches with yuzu and chive butter will have you full-on salivating. Get it from Walmart for $18.69. 2. A stainless steel electric kettle to quickly boil hot water so you can spend more time sitting back, relaxing, and sipping on a cup of your favorite herbal blend. 3. A variety box that'll provide you with a rotation of 48 delicious tea bags in eight different flavors. Includes eight varieties: English breakfast, Earl grey, lemon and orange, decaf breakfast, Assam, organic peppermint, organic chamomile, and green tea with jasmine. Get them from Walmart for $11.49. 4. A sloth tea infuser for having a quality tea party with a quality friend. Sloths are known for being slow, but you and this guy are gonna hit it off immediately. Made of heat-resistant, BPA-, phthalates-free silicone. Recommended to hand-wash! Get it from Walmart for $8.17. 5. A bottle of organic honey to naturally sweeten your tea — plus, if you rely on tea to help soothe a sore throat, a dash of honey is great at providing some extra relief, too! 6. A single-serve coffeemaker compatible with K-Cups, but cheaper than most other K-Cup-compatible makers you can find. 7. A 40-count variety of single serve tea cups for using in a K-cup compatible brewer, and perhaps even finding a new favorite tea blend as you work your way through the box! Get them from Walmart for $24.90. 8. Or a reusable K-cup you can fill with your favorite loose leaf tea blend to spare your wallet from constantly purchasing new K-cups, and the environment. Compatible with Keurig 1.0 and 2.0 machines, and of course also compatible with coffee! The best way to wash these is to dump out any leftover grounds, and then rinse it under water to help get rid of any left-behind particles. Then let it soak in a large bowl filled with one part white vinegar and two parts water for 30 minutes. Get it from Walmart for $4.92, or Jet for $4.98. 9. A set of four floral tea cups with lids that'll serve as a super pretty and functional way of sipping your favorite hot beverage, and transporting it from room-to-room without worry of spillage. These are made of durable stoneware and are microwave- and dishwasher-safe! Get them from Walmart or Jet for $19.52. 10. A bag of organic matcha green tea powder for whipping up fancy schmancy lattes, smoothies, and more without needing to spend your last paycheck at a boutique coffee shop. Get it from Walmart of $20.79. 11. A two-pack of silicone loose leaf tea bags to fill with your blend of choice, steep in hot water, drink, and then throw these babies in the dishwasher, and use them all over again. Comes with two random colors! To use, just fill with loose leaf tea, steep into hot water, and let it infuse for a delicious cuppa. Get them from Walmart for $7.89. 12. A double wall glass infuser bottle that'll make brewing and drinking the perfect cup on-the-go super easy and fast. Made of double-wall borosilicate glass that is safe to use for both hot and cold drinks. It comes with a stainless steel removable infuser and a stainless steel lid. This is dishwasher-safe! Get it from Walmart or Jet for $16.25. 13. A bag of tapioca pearls for keeping on-hand when the craving for a refreshing glass of bubble tea strikes, but you're not quite feeling like leaving the house. Get it from Walmart for $6.20, or Jet for $4.59. 14. A tea time coloring book to keep any tea lover entertained for hours on end. Not to mention, this is the perfect little pastime to accompany your hot drink... perhaps the drink of choice being TEA. 15. 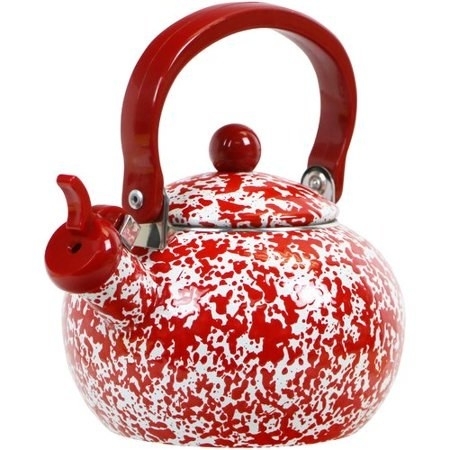 A glass stovetop teapot with a stainless steel infuser so you can not only boil water, but actually brew your tea at the same time!!! The future is now! Comes with a micro-mesh stainless steel filter perfect for using with loose teas and blooming teas! It's hand-crafted out of heat-resistant glass, and is top-rack dishwasher-safe, but can also be cleaned by hand if you feel more comfortable doing that! Get it from Walmart for $17.25. 16. A pack of ginger lemon creme cookies for a satisfying, sweet treat you can savor while having a tea party for one, because let's be real, you won't want to share these yummy cookies. 17. A tea flower set complete with a teapot, loose leaf tea infuser, lid, and a canister filled with 12 green tea flowers to gift yourself or the obsessive tea drinker in your life...or, you know, just yourself. Watching your tea blossom into a beautiful flower is a life-changing experience. Made of temperature-safe borosilicate glass designed to retain heat and freshness. 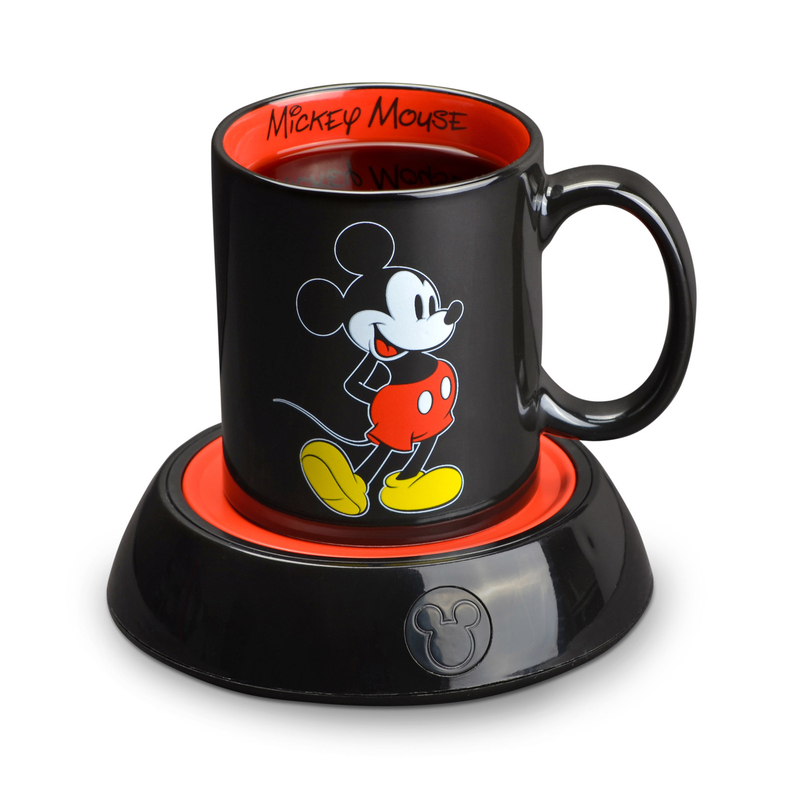 Features a comfy handle, yields up to five cups of tea, and is microwave- and dishwasher-safe. Set includes the teapot, loose leaf tea infuser, lid, and canister filled with 12 green tea flowers. Get it from Walmart for $17.99 (originally $29.85). 18. 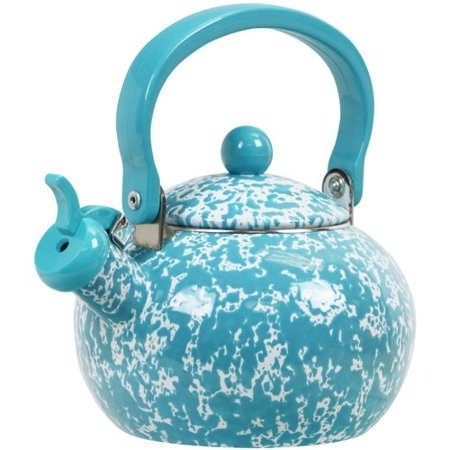 A super pretty, good ol' whistling stovetop tea kettle that'll make an exquisite addition to any kitchen. You can buy it and use it like it's intended (by boiling water) or just to decorate! Made of porcelain and stainless steel, and has a 2 qt. capacity. Also features a fold-down handle. Get it from Walmart for $35.99 (available in four colors). 19. A 16-pack of ginger tea I am currently OBSESSED with, and fell in love with after recently getting the stomach bug — I wanted something other than ginger ale to help me stay hydrated, warm my chilled body, keep my stomach settled, and soothe how crappy how I was feeling, and now I just drink this daily since then because I am in LOVE. Get it from Jet for $4.18. 20. 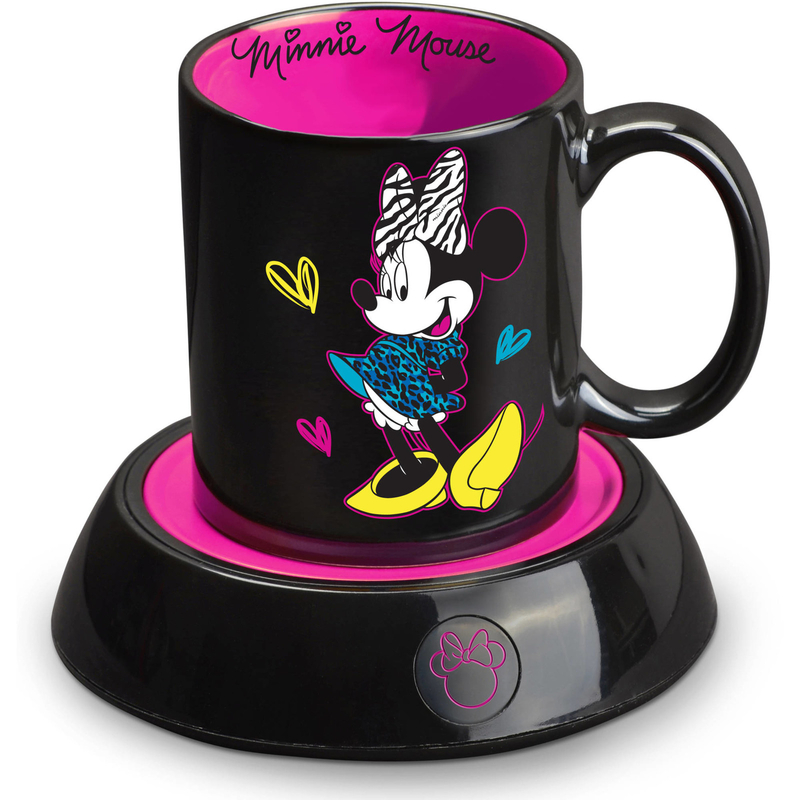 A Mickey Mouse or Minnie Mouse mug warmer with a matching mug to quickly heat up a cup of tea you've had sitting out a little longer than anticipated, but aren't ready to part ways with quite yet. These are good not just for warming beverages, but also soups! Features illuminated power lights and comes with a corresponding 10 oz. mug. 21. A tea tin that'll hold your loose leaf tea or even your tea bags, all while adding a pop of color and a touch of cuteness into your home. This is a durable, powder-coated canister with a white lid with a handle! Helps to keep fresh, too! Get it from Walmart for $13.11. And that's the tea on that.